Lantana bahamensis grows as a medium size shrub 1- 2 meters in height. The leaves are arranged oppositely with a crenulated leaf margin. The leaves are about 1.5 - 2 cm long. While the stem becomes woody the species does not form large trunks. The flower is zygomorphic with a 2 lobed calyx. The corolla is 5 lobed and orange turning reddish with age. The fruit is a drupe that turns black and shiny at maturity. The flowers are arranged in a corymb. Lantana bahamensis grows in disturbed areas along roads and old farm areas as well as sporadically through out the Dry Broadleaf Evergreen Formations (Coppice) in both limestone and sand substrates. 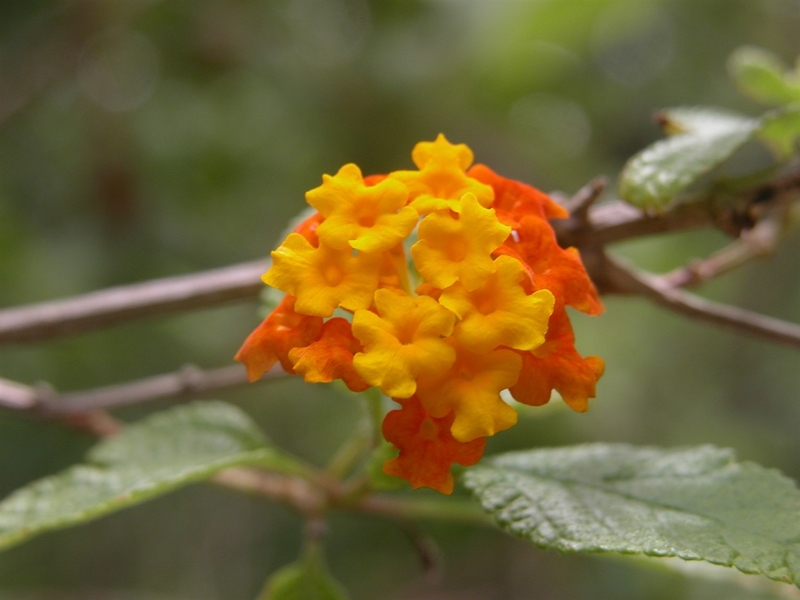 Lantana bahamensis grows through out all of the islands of the Bahamas as well as in parts of Cuba. There are many cultural uses of Lantana bahamensis and a closely related species L involucrata. The leaves are often boiled for use in strengthening and aphrodisiac teas as well as to treat types of dermatitis (added to bath water). They have also been used in the horticultural trade as a landscape plant because of their beautiful flowers and pleasant smelling leaves.